This earthquake, the earthquakes associated with it, and the tsunami which it caused, have left many in Japan in need of help. The whole country will be rescuing, feeding, and sheltering people whose houses, heat, water, etc. have been washed away for some time to come. Please help! 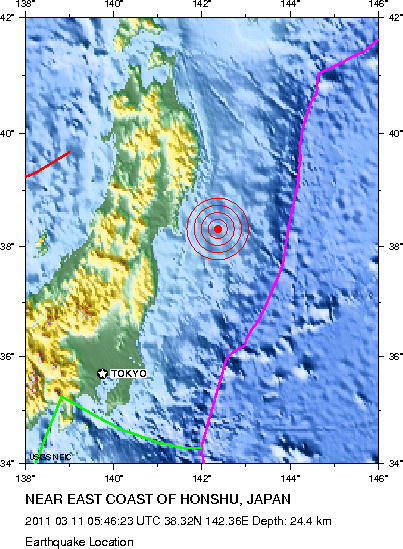 See the earthquake and tsunami sections in the links below for more detail. Click on a topic below to go to links on that subject. If you find new and interesting links I should consider adding, please send them to me. If you find broken or damaged links, please let me know. On-line lab warm-up: Virtual River at CalState goes through everything you need to know to do basic stream measurements. Check through this before (or after) the river field trip, though you may not need to go through the whole exercise. Stream gauge maintained by the USGS at Soos Creek hatchery for comparison with our measurements. Link to a more advanced geology class including river processes - ignore the math, but you can use this page to review some of the terminology, and each link on the page takes you to a photo or diagram. Good images! The picture for the last section of the glacier map lab is here. Note that B is composed of unconsolidated sediment. This picture above was taken from the picture archives of the The National Snow and Ice Data Center, which has an incredible archive of glacier photographs going back to the 1880s. Many of these photos are used in determining the retreat or advance of glaciers in the last century. Also check out their photo collection of more recent images, including different types of glaciers, erosional and depositional landforms, etc. Short report in PDF format from the U.S. Global Change Research Information Office about likely effects of global warming to the Pacific Northwest. Website from a physical geography class giving a description of ice ages from a slightly different perspective. Includes use of some of our glacier-related vocabulary and a glossary. A geography education website from Karen Lemke at the University of Wisconsin has a great set of on-line photographs and definitions of glacial landforms. Our class does not go into as much detail, so some of the terminology may be unfamiliar. A great feature of this site is that she shows both a photo and the topographic map for the same place, so you can also use this site to practice seeing the relationship between topo maps and the shape of the land. Wave state and other information from oceanographic buoys run by the National Oceanographic and Atmospheric Association. Click on any map to see the buoys in that area. The buoy at the Columbia River bar. Of course, the U.S. Navy keeps track of wave conditions all over the oceans. They have an unclassified site from which you can click on maps showing current and forecasted wave conditions. Colors on the maps show wave height: the little arrows show dominant wave travel direction. Washington State Department of Ecology has a nice Coastal Information website. Includes descriptions of the different types of coasts we have, and, if you click around a little, there are good descriptions and pictures of coastal processes, such as longshore transport, which are definitely better than my whiteboard sketches. USGS has an on-line newsletter about coastal research. Many articles are geared towards the informed layperson, rather than the research community. You get a look into up-to-date research topics. The Pacific Marine Environmental Labs have a tsunami research and warning page with great pictures and information on recent tsunami. Focused on western United States. The TIME links are particularly interesting to look at. These are simulations of the tsunami which would likely be caused by various worst-case-scenario earthquakes on out west coast. Be patient - they take time to load. YouTube video from PMEL showing the propagation of the tsunami from the Honshu quake. A town on the coast of Miyagi Prefecture is hit by the wave. Video from NHK by way of PBS. Another branch of NOAA is the Pacific Tsunami Warning Center (in co-operation with other countries around the Pacific Ocean). Wikipedia's excellent page on tsunami. Tsunami risks related to VERY LARGE earthquakes along our coast - page includes descriptions of evidence for tsunami from January, 1700. USGS Landslide Information page - links to general information, pictures of different mass movement events, scientific papers, more.... Also leads to graphs for the landslide homework. Direct link to the USGS Open-file Report on La Conchita's landslides. Some of the reading is probably more science-jargon-laden than you will be able to enjoy, but the photos and graphs are accessible. Canada's similar site from Canadian Natural Resources. Excellent photo gallery and information about historical landslides in Canada. A few winters ago some kayakers nearly got killed by a small mass movement event on the Sultan River, part of the Skykomish watershed. Film at eleven! See if you can decide what kind of mass movement this was. Sadly, I haven't found any interesting 100-level sites for weathering. Let me know if you find one. The University of Oxford has a collection of on-line images of rocks in hand-sample and thin-section (microscope view). This site is from a science textbook publisher, and has good basics on the rock cycle. Part two, in particular, shows an animated block diagram of a subduction zone, with subsidiary animations for many rock-forming processes. Be aware that the processes described do NOT only occur in subduction zones! California State University at Long Beach has a good tour of each of the main rock types, including discussion of formation, description, and classification. Check out igneous, metamorphic, or sedimentary. Richard Harwood, a geologist at Black Hawk College in Illinois, has developed a number of web-based geology and geography teaching tools. His Geology 101 page has practice in a number of topics, including rock and mineral i.d., plate tectonics, etc. You cannot click directly to the labs page: the link will take you to the course home page. From there, click on "Lab Material" on the sidebar and look around. There is also an exercise for metric units and scientific notation listed with the labs. Includes automatically graded "quizzes." Yet another NOAA page - this time a quick look at limestone reefs. The Kamchatka Peninsula has some of the coolest geology around (no pun intended). Volcanoes, earthquakes, geothermal activity, glaciers, etc., etc. This page has been translated to English. I've put it under volcanoes rather than any other topic simply because I like their volcano stuff, including webcams of three of the most active volcanoes on the peninsula. Remember the time zone difference - a black screen means it's still the middle of the night there, not that the webcam is broken. And another Kamchatka Peninsula link, this one just about volcanoes, including information on the several dozen active volcanoes out that way. Good maps. Locally, most people are interested in Mt. St. Helens. The Cascades Volcano Observatory is _the_ source for all kinds of information about the Cascade volcanoes. Includes both specific information about each volcano, and general descriptions of our plate tectonic setting, etc. Alaska must have the most active volcanoes of any U.S. state, including Hawai'i. The Alaska Volcano Observatory is thus pretty interesting. I find it a little hard to navigate this site, but there is a lot interesting material. Caltech has a site showing infrared (heat) images of a number of things, including a number of hot springs/geysers and volcanic eruptions. These are Quicktime movies, and show regular visual light movies side-by-side with infrared. Probably the thing that gets most people excited about geologic time is the fossil record, the study of which is paleontology. We won't be talking about fossils much in this class, but for a good look at life throughout geologic time, check out the UC Museum of Paleontology's web tour. There are tectonics links on these pages, but they mostly seem to be incomplete. However, there are plenty of photos of and other information about fossils. Again from CalState, some practice and visuals on radiometric dating, Virtual Dating. Nice animated graph showing half-lives. This page is a web version of poster showing the ages of the rocks on the seafloor all over the world. Click to get an enlarged view (i.e. big enough to read). From the National Geophysical Data Center (see database section for link to their homepage). These dates are from a combination of radiometric dating and magnetic techniques. The Silurian Reef homepage from the Milwaukee Public Museum is an example of research into one particular time and place in Earth history. USGS page describing radiometric dating techniques, with a few examples and a little history. See the Earthquake section, below, for Virtual Dating at CalState. Practice using radiometric techniques, including on-line quizzes. If you are interested in dendrochronology (tree-ring dating), check out this website focused on bristlecone pine trees. The site is a very interesting overall look at one of the most beautiful mountain ranges in California. Here's another dendrochronology site from a lab in Tennessee with a great deal of detail. I particularly like the slide shows, some of which is focused on how the science in done, some of which is beautiful. Athro, Ltd., is some kind of on-line, for-profit, education company. I don't generally link to commercial websites, but this one doesn't seem to have ads, and the information about geologic time is both simple and useful. Check out both the Geologic Time Scale and the relative dating exercises. Slightly off-topic, but dealing with geologic time, is NOAA's paleoclimatology website. This is the study of changes in climate over timescales ranging from the last few years to 100's of millions of years. Most of these links give access to data collected and shared by scientists, but the "Outreach" links are good for intro students interested in Earth's warming and cooling. I suppose this could also fit under the Glacier section, but there's so much more than just ice core data! Some tsunami information is linked below, also see the links under Tsunami above. CalState's Virtual Geology page - links to the Earthquake lab, and others which may be of interest, particularly the exercises and demos about radiometric dating, Virtual Dating. Seismologists at Washington University in St. Louis (my brother is studying philosophy there) have made available on the web a number of animations showing earthquake waves traveling through Earth. This site has great visuals, but there a couple of caveats: first, you need Shockwave Media Player to run these animations. Second, they take a long time to load. Even if you have broadband it will take a few minutes. Be patient, and your reward will be great! Third, scroll down to the bottom of the page for loading information, which basically says that you need to right-click on an animation link and select "Open link in new page" (my preferred method), or hold down shift and left-click. In the Pacific Northwest we have earthquakes on the brain - for good reason! See the Pacific Northwest Seismic Network for information, data, etc., about earthquakes in our area. In particular, there are some good visuals showing the Cascadia subduction zone and leading to information about great earthquakes here. Take a look at the local seismographs - including the strong-motion sensor GRCC has in the basement! PNSN is the regional branch of the National Earthquake Information Center (where I showed you the earthquake maps in class). This is the world map of current earthquake activity from NEIC - a good way to see what's been going on lately. You may have to scroll down to view the map. Click on any square for more detail on that earthquake. Information about preparing for and surviving earthquakes in our area - no joke, this could happen anytime, and the time the Big One will occur cannot be predicted with precision. However, here's some information on current research into a possible link between electro-magnetic waves and earthquakes at New Scientist. Local large earthquakes are a serious concern - and so are the tsunami which would result. People at the Pacific Marine Environmental Lab out at Sand Point have done some ugly math to predict the tsunami resulting from various earthquakes in our region. These require Quicktime, a little patience for loading, and a strong stomach for disaster. Some links to information about the Nisqually quake: an engineering firm report on local damage, the shake map showing what people reported around the Sound, and an interesting artistic result in a sand tracing. Many of the earthquake links are relevant for this topic, particularly ones that show eq waves traveling through the interior. Cornell University has some great web geology: the first few are mapping tools, then a set of simulations of geologic interest, and lastly some 3-maps. I haven't played with the 3-D maps, but the other tools are fun, so I expect those will be too. Basic tectonic plate map from USGS. A NASA group doing research on plate motion has a number of maps available. Another NASA project, satellite images of both geological and other interesting Earth events. Updated regularly to show current events. PaleoMap project shows plate tectonic motion through time, including some nice animated versions. Also paleoclimate. Maps reconstructing the geology/geography of the Western U.S.A. through geologic time. From Northern Arizona U., very thorough. Back up to Ron Blakely's home page to find links showing other reconstructions. TerraServer generates topo maps and air photos for any region of the U.S., as well as many other countries, at several scales. The free version is plenty informative, just ignore the watermarks. Try punching in your zip code to see what your area looks like as a topo map and aerial photo! Jules Verne's fans at UNAVCO have made a fabulous web-based map tool for many geologic features of Earth, as well as maps for other planets and moons. Try the "Junior" versions first. They load faster and will give you an idea of the different datasets available. The National Atlas - your tax dollars at work, making information about many subjects publicly available. I use the Map Maker/Geology layers, but you could find out about, say, cotton production, or population growth instead. I _think_ this site is hosted by USGS. NPR's show Science Friday is hosted by the guy who used to do Newton's Apple on TV, Ira Flatow. For interesting discussion of science for the general public, some geological and many other science topics are covered each week. Interviews, explanations, brain worms, global warming, dinosaurs, medical breakthroughs, famous scientists, etc. etc. Listen on-line or on KUOW, 94.9 FM, Friday, 8-10 p.m.
News Flash - Science is Hard! Current Science and Technology "News" at the Onion. What? You don't know about the Onion?!? Click immediately for fun to commence! Link to a periodic table. Click on an element to find out all the details of its chemistry. Occasionally an element will not load properly, but generally works well. Richard Harwood, a geologist at Black Hawk College in Illinois, has developed a number of web-based geology and geography teaching tools. One exercise gives practice and explanations of both metric units and scientific notation. You cannot click directly to this page: the link will take you to the course home page. From there, click on "Lab Material" on the side bar, and then "Metric System and Scientific Notation." Includes automatically graded "quizzes." Check his Geology 101 page for more on-line practice, particularly the lab pages. USGS has material geared towards K-12 education, including web material for both teachers and students. Wright State University in Ohio has a website for K-12 outreach. Check out the Activities link for some good classroom ideas. These are straight-up geology projects. For some reason, the acronym for the Society of Sedimentary Geologists is SEPM. They have a K-12 education site covering a variety of geological topics, not just sedimentary rocks. Earth and Sky is the home page for a daily radio short about a wide variety of astronomy topics. The site includes teacher resources 'way beyond what you would expect from a radio short! Our local radio station KBCS, 91.3 FM, broadcasts E&S daily at 9:30 a.m. Here's a website based in the "Classroom at Sea" oceanography program, from the University of Southampton in the UK. These projects are more for high school and jr. high, from what I can tell. Our own University of Washington School of Oceanography (of which I am a proud graduate) has a K-12 teacher training program, REVEL, in which they take teachers to sea to do oceanographic research and develop lesson plans based on their experience. Lesson plans are sometimes hidden in unexpected links, but definitely take a look at the program, particularly the opportunities to go to sea yourself, and the daily web-site updates when teachers are out on a research cruise.